10/12/15 An Ultrasonic water level sensor installed in the 10,000 gallon at August Vineyards has provided real time visibility into the status of the water supply at the site which is shared between a home, landscape and vineyard. Two irrigation timers control 24 irrigation blocks. With no visibility into how much water each irrigation block was using the renter chronically ran out of water each time an irrigation schedule change was made. The second time it happened while the renter was soaped up in the shower. The CS3 tank level monitor enabled the owner to get his landscape manager's water use under control and keep his renter. The site has a reliable well but, it's recovery rate is only 4 gallons/minute hence the need for the tank to buffer water for higher flow use like irrigation of the vineyard. Fire protection reserve of 5000 gallons further limits the buffering capacity of the tank. Careful management of the water use is necessary in this application. This single sensor monitor not only shows the water draw from the tank at any given time but, also shows the rate at which the well is able to refill the tank. Matching the falling slope of the tank level draw to specific intervals in the irrigation schedule reveals exactly the flow rate into each block and multiplying by the time of the interval gives the cumulative volume of each irrigation. This is an excellent example of how a single sensor placed strategicly can provide a lot of visibility into the behavior of a complex system. 8/29/15 Mount Veeder, Napa Valley. 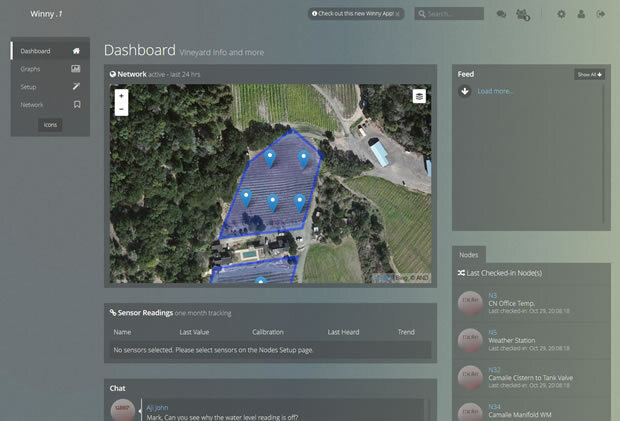 Pulido Vineyard Management has adopted Camalie Networks vineyard monitoring and irrigation control system as its primary tool for irrigation management and now considers it a key differentiator. Ramon Pulido says "This technology saves labor and water. Vineyard owners like to see what's going on." PVM is now using the technology in 4 of the vineyards it farms. 11/15/14 St. Helena, Ca. Eight nodes including 6 soil moisture monitoring stations and one weather station were deployed to this 50 acre vineyard. Below is a sample graph of soil moisture tensions from Watermark Sensors at three different depths in one of the blocks for the 2015 growing season. May 12, 2014. AgTech Palo Alto, Ca.. CS3 system software, firmware and build scripts developed in collaboration with Professor Michael Delwiche's Biological and Agricultural Engineering Lab at UC Davis were released to open source. The code is currently available from the Camalie Networks download page but will soon be available from Github as well. This code is being released to provide a low cost core platform for agricultural monitoring and control. It is arduino, XBee, Linux, Apache, RRDTools standards based and can be built with low cost off the shelf board level components. The 900HP XBee radio modules at the core of CS3's wireless self organizing mesh have the long range and self configuring relay cabability that commercial agriculture requires. This release is intended to provide a low cost open alternative to the closed vertical solutions currently available. The CS3 backbone addresses the need of agricultural application developers and researchers for a standard open source transport between the field and the web. May 6, 2014. In Collaboration with Open Sprinkler developer Rayshobby Camalie Networks has developed an arduino shield for CS3 capable of actuating up to 4 bistable solenoid valves when plugged into a CS3-ZX arduino node. Below you can see see the node in action, see it with the lid open and see it on a bench testing drive of 4 solenoids. Testing has shown that the energy use of this driver is very low. Without solar recharging the node was able to switch solenoids 8000 times over a day and a half before the 3 NiMH rechargeable batteries discharged. The shield's boost voltage is programmable up to 21V giving it flexibility and plenty of drive to handle any bistable solenoid currently out on the market. Testing was done with DIG solenoids which require a 9V pulse. April 26, 2014. Camera board with low power modes and interchangeable cameras was aquired and tested for use on the CS3-ZX, Terraduino and Galileo nodes. This camera board from arduCAM is very versatile and inexpensive. It comes with a 2Mega Pixel camera but can be upgraded to a 5Mega Pixel camera. This is an important component for enabling computer vision in the field. The Open Computer Vision library supported by Galileo and the X86 compute power of the Galieo's Quark processor are two other key components required. May 2, 2014. Our Maxbotix Ultrasonic range finder has now been deployed for deer detection. It stands sentry all night recording and if a large object presence is detected for some threshold time to alert the grower to the presence of large mammals (or vehicles) in a row in the vineyard. Here you can see it watching over a vine that has already been decimated by one of the 200 lb. pests. This device is solar powered and completely wireless, transmitting data in real time to the web. It can be moved and cable tied to a stake in a new location in a matter of minutes. It's cost of $580 can easily be recouped with the elimination of a single deer. Usable lifetime for this device is 5 years, at which point the rechargeable batteries will need to be replaced. This could obviously be placed at an access gate as well to record and alert for the presence of 2 legged pathogens. This simple solar powered wireless distance measuring device is portable and easily moved to wherever you want to sense something within 16 ft. of the sensor. In this case it is being used to sense the distance to the surface of the pond below it. Below is a plot of the data from this sensor showing filling of the pond during the rain event from 2/27-3/6/14. The noise in the curve is due to sonic interference from raindrops hitting the surface of the water. The Maxbotix sensor uses ultrasound to measure distance. Available now. March 28, 2014. The first CS3 commercial system was deployed at Stage Coach Vineyards. It has been transmitting to Camalie Networks and TerraView servers non-stop since then. A second system was installed shortly after this at the former Calistoga Airport site by SenseTerra. The TerraView interface is now also up and running for this site. 12/6/13 A new field node for agriculture called Terraduino developed by SenseTerra is currently in field testing at Camalie Networks. It has been integrated with a CS3 system and is sending sensor data to CS3 cloud servers. It's arduino compatibility has enabled reuse of the arduino sensor interface software developed for the CS3-ZX node as well as open source software developed by the arduino community. It's very low power and 4 "Sensor Shield" ports make it ideal for agriculture where solar power operation and ease of sensor connection are essential. We are currently taking pre-orders for the first volume build of these units. The Terraduino node is expected to be the workhorse for applications in commercial agriculture. 1/7/14 The Intel Galileo Board was integrated with the CS3 system in just a day and a half thanks to the arduino standard that both CS3 and Galileo support. Galileo with its high performance Intel x86 Quark processor now provides the ability to process large volumes of data such as video in the field and send back just the essentials extracted from that data across the CS3 long range wireless mesh. Galileo does this cost effectively with a price of just $69.00 which makes it practical to deploy multiple Galileo based nodes on a network. 11/28/13 Aji John, CEO of Calvert Ventures, announced that his company will provide Web Services for users of CS3 Networks. These services will include viewing, and analysis of data as well as secure storage, backup and network commissioning. Network commissioning includes defining blocks on a map , placing nodes on the map, naming nodes and describing sensors. A screen capture of the new software is shown below. The Calvert Web Site provides a full featured user interface and data mangement for those customers needing more functionality and security than the basic open source CamView service that Camalie Networks provides. The CS3 system is available as of 8/22/13 to technologically savvy, customers for field use and development. Camalie Networks System 3 is still at an early stage of development but sufficient progress has been made to provide early adopters with valuable functionality at very low cost. This system provides long range (>2 mile mesh links) for monitoring and control at a price point less than half of any competing solutions. There are two different CS3 node models, the Z and ZX shown below. The Z shown at right is a basic model for data acquisition and simple digital actuation. The Zx model shown on the left in the image below has an arduino compatible base board with real time clock and SD card slot for local data storage of Giga bytes of data . It has sockets to accept most arduino shields which now number in the hundreds. 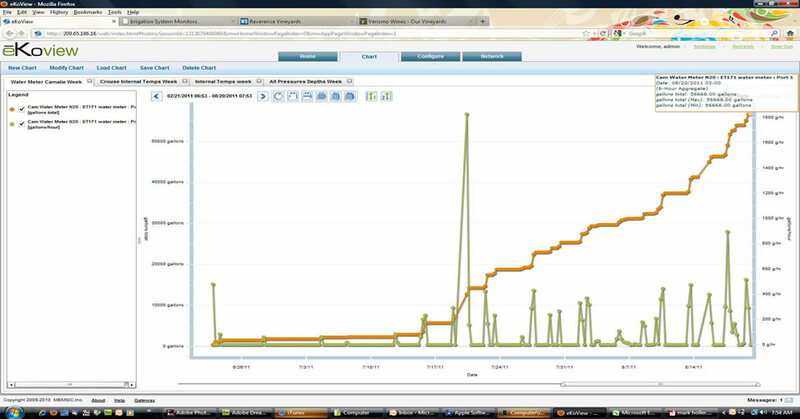 On 4/21/13 Camalie Networks introduced the eKoTran software upgrade to the eKo Pro system. With this upgrade the eKo Pro system can deliver its data to web clients without the need for a static IP address or firewall/router configuration changes. It also provides a new user interface which does not require an Adobe Flash add on to the client's browser thus enabling growers to view eKo Pro data on their iPhones. This is accomplished by routing the data to a high performance Camalie Networks Server which hosts the new user interface and a copy of each grower's data. The cost of this new eKo Pro Web Service is $12.95/month. It includes storage and backup of a copy of your data at Camalie Networks and software upgrades and fixes managed at Camalie Networks. This new web service and software upgrade are an early release of portions of the CS3 technology currently under development at Camalie Networks. A preview of CS3 in action was shown at the Napa Valley Grape Growers'/UC-Davis Oakville Station Field Day on Friday May 3, 2013. The demonstration was reported by Ag News. On 11/1/12 Camalie Networks deployed the first nodes of its newest wireless network system called Camalie Networks System 3 (CS3). It is targeted to provide sensor data acquisition at a break through price point of $260 per location. This radically lower cost product with much simplified network installation is expected to transform agricultural monitoring and control from a high end niche capability to a check box feature of any new irrigation system. It's open architecture makes it easy to extend and customize. It achieves its lower cost by taking advantage of the intense competition going on between wireless technology providers which has now pushed the cost of the node radio electronics below $40. Camalie Networks is now looking for partners to participate in early trials of this system. Please contact us if you are interested. On 4/20/2012 a 15 node system with 12 eKo Pro valve actuators, 32 soil moisture sensors and 4 water meters were installed at Four Winds nursery just below the dam at Lake Berryessa. The system is being used in an experiment run by Prof. Delwiche and researcher Bob Coates at the University of California - Davis. The experiment is an exploration of the benefits of using full automation in nursery irrigation. Expected benefits are reduced water use, less leaching of chemicals from the pots into the soil, reduced labor cost and increased yields. The system executes soil moisture sensor dependent control rules in real time with irrigation cycles as short at 1 minute on 5 minute intervals. Data can be viewed and valves actuated from any web browser. 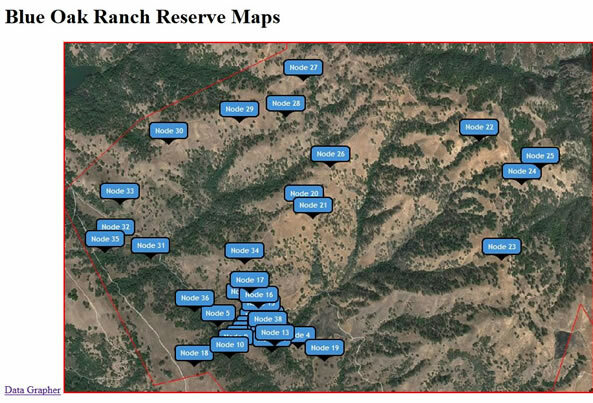 This new capability meets the requrements of California state law for large landscapes. See section 492.7 that states "Automatic irrigation controllers utilizing either evapotranspiration or soil moisture sensor data shall be required for irrigation scheduling in all irrigation systems. " With the addition of actuation capability the eN2120 node power supply has been beefed up by doubling the battery set from 3 to 6 rechargeable AA batteries. The additional energy storage enables essentially unlimited actuations over as much as a 3 week sunless period. At the same time the solar panels were upgraded as well. All new units have these new features at no additional cost. The dominant use of eKo Pro systems is for monitoring soil moisture and weather conditions to make the best irrigation decisions. Water use, flow rates and actual remote control of valves are capabilities added last year to the Camalie Networks line up of products. This year there are advancements in the software and reliability of the system as many systems have now been online in the field for over 3 years. The extensive field testing and characterization of the eKo Pro system is one of its major strengths relative to other suppliers in this space. The other major highlight of eKo Pro is its low cost enabling deployment of more stations per acre. Typical systems consist of 10 nodes with some containing as many as 35 nodes. No other wireless monitoring system is able to reach these sampling densities at an affordable cost. The water metering capability was added to the Camalie Networks product line in August 2011 with the addition of the CN101-WM water meter interface. 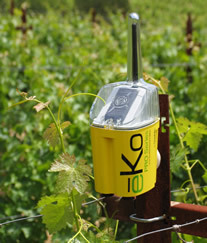 Four water meters and eKo Pro interfaces to those meters were installed at Green and Red Vineyards in the Chiles Valley. Photos from that installation are shown below along with the data taken in 2011. NRCS supported this installation. Below is a plot of water use at Camalie Vineyards on Mt. Veeder captured using one of the new CN101wm watermeter interfaces to a standard Netafim water meter with a reed switch in the meter register. The orange curve is the cumulative volume used and the green curve the actual flow rates. One filter blockage event was spotted on 8/7/11 and quickly cleared. This new user interface called CamView, developed by Camalie Networks does not use Adobe Flash technology and as a result it is readily viewable on iPhones and iPads. 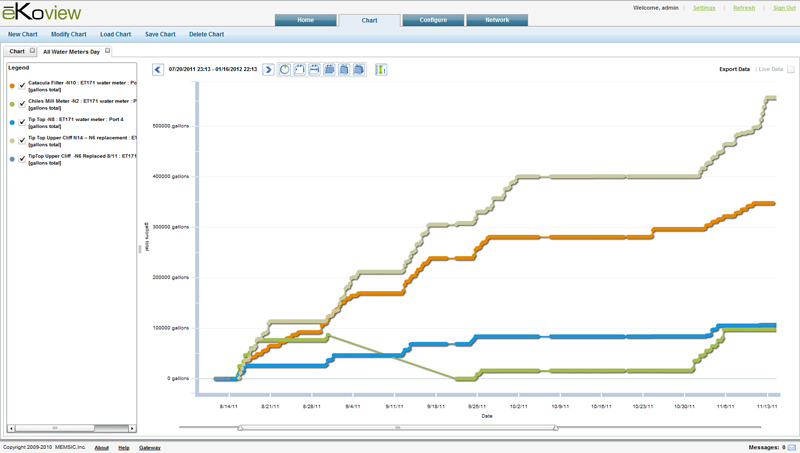 It also supports multiple graph dashboards to enable the fastest possible review of your vineyard status. This software which includes an independent database for storage of eKo Pro data can run on your eKo Pro Gateway or will run on any server in the "cloud". Running this software in the cloud provides faster access, ease of backup and lower cost software maintenance. This software is fully compatible with eKo View and runs in parallel with it requiring no modifications to eKo View. It uses sockets that eKo View provides to access a copy of eKo View's data stream. 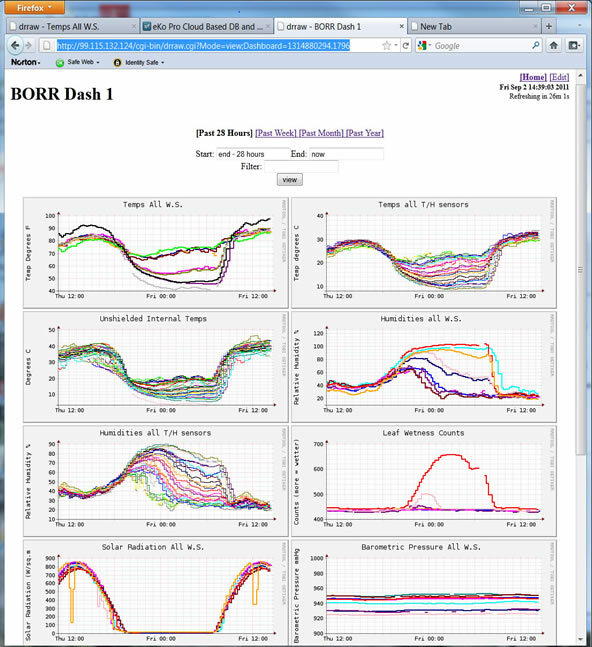 It is capable of monitoring multiple eKo Pro networks at the same time and graphing any or all of the data together. Currently one system is aggregating data from 12 eKo Pro networks spread out over the California North Coast. Because the software is open source and free like Android the user community can enhance and maintain the software without dependence solely on Camalie Networks or Memsic. This model has proven to be very successful. You can find CamView on SourceForge. This is an early release and installation is fairly involved, not recommended for the average eKo Pro user. Rather it is intended for SysAdmins familiar with Linux webservers. Call if you are interested in using this software. 650-799-6571. Access to a working system for evaluation is available now. Estimating Leaf Water Potentials from Soil Moisture and Vapor Pressure Deficit Data. City of Hollister 4 Nodes; recycled water leaching monitor. J.K. Engineering Ltd. Canadian Golf Course 10 Nodes Demonstrated lowest temperature performance of eKo Pro to date -40C! Camalie House Mechanical System This is the original 433MHz prototype network deployed at Camalie in 2005. Still working. A great article "New Networks Take Nature’s Pulse" in the Innovation section of the Christian Science Monitor was written by Lori Valigra about our wireless sensing. It was published January 23, 2009. Wines and Vines published the article, Wireless Network Monitors H2O in July 2008 about our success in using wireless soil moisture sensing written by Tom Ulrich. On June 19, 2008 Camalie founder Mark Holler presented a technical poster, High Density Wireless Soil Moisture Monitoring for Deficit Irrigation Management at the ASEV conference in Portland Oregon showing that less labor intensive soil moisture sensing can substitute for manual leaf water potential measurements. Crossbow Technology introduced the eKo Pro Series Agricultural monitoring system in April 2008. It is a commercial version of the wireless sensor network developed at Camalie Vineyards. Camalie Networks LLC was started up at the same time in April 2008 to sell, service and customize eKo Pro for viticulturists in the Napa Valley. Mark Holler in the Camalie Networks server facility in Palo Alto. Saracina Vineyards, Hopland, Ca. John Fetzer proprieter. eKo Pro 4 nodes. Mount Veeder Magic Vineyards eKo Pro 8 nodes sharing the Camalie Vineyards Gateway. Konrad Vineyards eKo Pro 9 node system sharing the Camalie Vineyards Gateway. http://www.flow-aid.wur.nl/UK/ In the U.K. and Netherlands managing water for potted plants. http://www.valledecasablanca.com/ In the Casablanca Valley in Chile growing grapes. Camalie Networks Opened for Business in April of 2008. Last updated: 8/17/15 Note on pronunciation: Camalie rhymes with "family"